No job too well known as making paper, planting peach or planting blueberries, but ornamental fish farming in Yen Phu also contributing to the characteristics of an old village on the ancient land of West Lake. Located right near the center of Hanoi, close to several busy urban area of West Lake, but the Yen Phu village retains a simple beauty, the wild countryside of Vietnam. 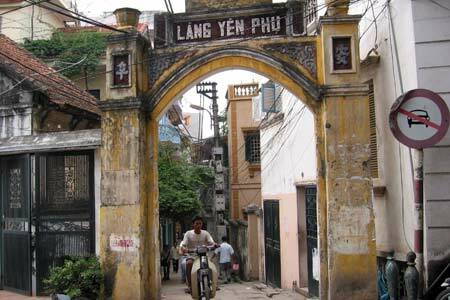 Go all the way Thanh Nien between two large dreaming lakes of Hanoi – Truc Bach Lake and West Lake – a small climb up the small slope, then turn on the Yen Phu street a few hundred meters, you’ll see the port village of Yen for design wanderous is very special. Winding village road, winding green space in the grass, trees and leaves. Where is the stuff that looks shrines, temples ancient moss. Sometimes the appearance of new high-rise buildings are springing up with a new architecture but still could not drown out the deep beauty of which is the ancient village of Yen. Suddenly a voice of fish lash resounding makes travelers startled to realize you are standing between space full of fish. 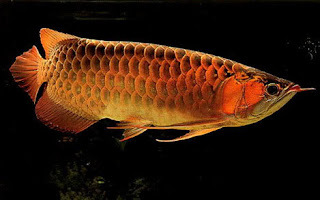 There are many kind of fish as swordfish, golden fish, zebra fish, seven colors … but people still call this fishing village popular fish or “grass fish.” These are the types of fish from traditional ancient village. Work to keep fish seemingly simple but actually extremely sophisticated, requiring farmers to be really passionate, careful, meticulous to be able to do. Anyone say that keep fish like to bring up child that truly! Daily, farmers have to get up early morning feeding, each fish tank inspection, removal small fish and medical fish. Food of fish only worms and Hong Tran(a small creature similar worm ). However, if small fish are not eating the worms that people early morning to fish Hong Tran out the river, very little filtration for small fish eat. Afternoon needs for food, medical and water changes. 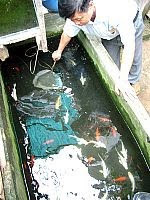 Characteristics of fish live in water environment is very clean, so that farmers have to change her water often, if not fish will get sick or die of asphyxia. North of Vietnam with summers baking sun, winters that water very cold so that the personal care, keep warm for more fish harder. Is hard work so that income from fish farming was not of how much. There were many families to abandon the traditional occupations of ancestors, but it looks like fish farming has become the “profession” that farmers are not easily abandoned. Today, although there are many ornamental fish village appeared in Hanoi, but ornamental fish Yen Phu village where are the big fish for distribution to Hanoi. In Hanoi, most major markets such as Dong Xuan market, Hom market, Mo market … were “taking trade” Yen Phu fish by a variety of beautiful fish, very reasonable prices. Currently there are 20 Yen Phu village household businesses scenes in which famous Tam Xuan, Yen Loi, Vu Hanh store . Each household has its own fishing secrets, from how to choose the same method for rearing fish quickly make large, healthy and beautiful. Someone needs in public school textbooks, looking for good people to learn how to breed new varieties. Yen Phu village with a list of their currently receiving the people that want to business fish in many places to this place, they rent and sell fishing shops throughout the country.Between noisy and gaudy Hanoi that retains a traditional village has just beautiful, so simple is valuable. Over the vicissitudes of history, the fishing village on the Yen Phu still engross on the fish pots and preserve the traditional family to fame of Yen Phu ornamental fish village to be handed down to posterity.